Take a look at some meaningful Rules that I agree. 1) Cherish and treasure your partner! There is always someone out there who will be more than willing to treat your partner as their priority and love them the way they deserved. If you don't cherish, don't regret. 2) In a relationship between two, put down your ego. A lot of times, minute misunderstandings turns into nasty cold wars due to the ego of APOLOGISING! I do apologise and I do initiate a make-up. If apologising or initiating help to save the day then why not? Quarrels are inevitable in a relationship. Somehow I feel that each quarrel sometimes brings me more reasons to cherish my partner and also my relationship. It's very vague to tell you what is understanding about, and what is putting yourself in his/her shoe. Guys, imagine this: You know your girlfriend is bored at home today and you try to cheer her up by calling her. After 2 tries, you gave up. For the next 4 hours of non responses from texts and missed calls, you MIGHT start to "get worried" (Although usually the guys are more optimistic). Then you found out that she has been shopping with her bestie/herself for the past 4 hours. This situation is very familiar to most girlfriends when they presumed their boyfriends have gone MIA for the past 4 hours only to find out that they have went to la-kopi with their friends, watch back to back soccer matches or gaming. Girls are insecure creatures, so you guys can try to remember texting your girlfriends on you next possible activities so at least you can avoid some unwanted dramas. Right? Girls, imagine this: You have finally got the chance to meet up your 3 BFFs for your Sundy high tea session. You girls have got lots of catching up, gossips to share and was engrossed in discussions of everything under the sun. For every half and hour of so, your boyfriend start texting you "Dear, where are you? ", "Dear, so what time you going home? Look forward to your reply! ", "Forget about me le?" YOU WILL GET IRRITATED RIGHT?! I learnt from "mistakes". I learnt what is putting yourself in his shoes during situation like this. No one wants to be disturbed in the middle of something you enjoy doing! When your partner is busy engaging in a soccer match, gaming or catching up with his friends, find something interesting to do! Whatsapp your BFF and grumble! I do that very often to my dearest Simin as well! No matter what your golden rules might be, I hope it work for you and wish you all the best in your relationship! 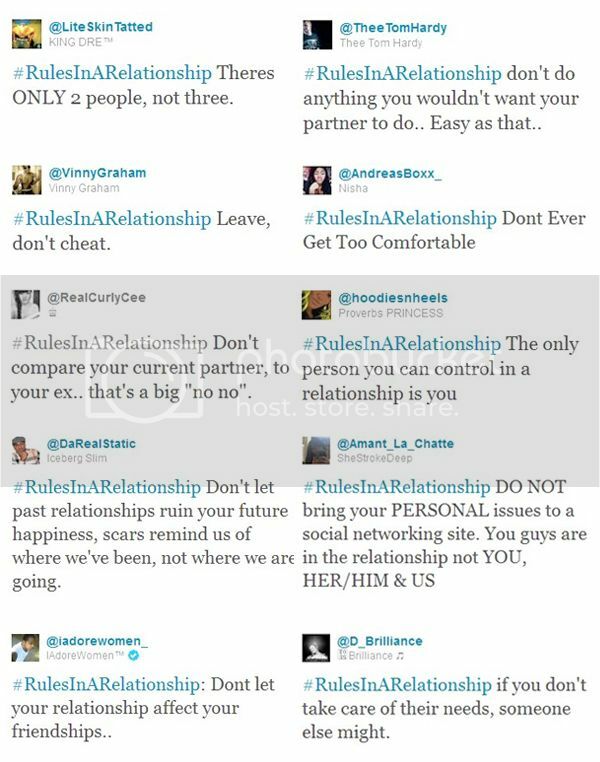 Comment below to let me know what is your Rules In A Relationship!